Landscape Maintenance - Fort Collins Landscaping Experts | Advanced Landscaping & Sprinklers, Inc. Your home is an extension of you. It reflects your values and personality. But in order to preserve that, it’s necessary to keep things healthy and thriving. To do that, you’ll need to make sure to have scheduled landscaping performed on your property. Following a maintenance schedule not only preserves the life of your landscape, but it also enhances the overall look of your property. Plus, a well-landscaped home has added curb appeal and increased value. 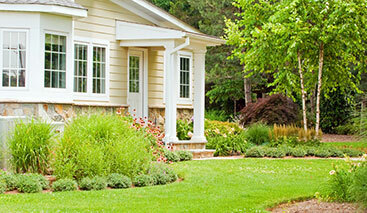 At Advanced Landscaping and Sprinkler, we provide regularly scheduled lawn maintenance needs of all kinds. If you require weekly, bi-weekly or monthly upkeep, we’re the ones to call. Our teams will perform lawn care, like mowing and aerating. We can also handle weeding, shrub pruning and trimming, planting, deadheading and general clean up. In order to ensure the health of your ornamental shrubs and trees, we can prune them to limit their size. By doing this, we can make sure the plant doesn’t become too large for its location in the landscape. Need annual or semi-annual maintenance? We can do that too. We recommend a full aeration once per year for the health of the grass. Fertilizer can also be applied to encourage healthy root growth. We also offer multiple seasonal options, like potassium, to help your turf sustain heat stress during summer, or winterizing fertilizer to strengthen roots and help with spring green-up. Whether you require the simplicity of lawn mowing or the preservation of beloved gardens, we’re here to help. Contact us today for a free estimate!